The various species of chameleons are some of the most fascinating of all lizards. Almost half of the world’s chameleon species live on the island of Madagascar, with 59 different varieties existing only there. The chameleon’s sticky tongue can reach out to about twice their body length as it shoots out to snare prey. They sport protruding, independently movable eyes, but when one eye detects an insect, the head turns to allow both eyes to focus on the prey before they aim their projectile tongue at it. 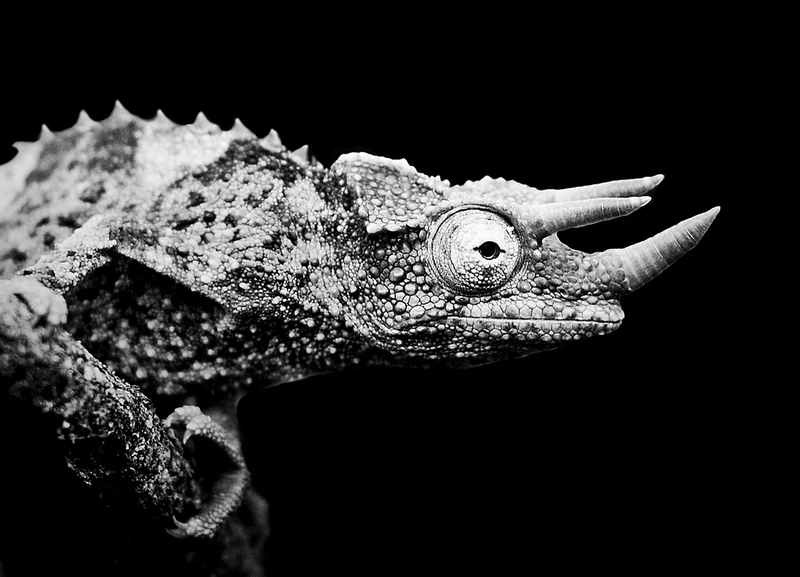 The feet of chameleons are highly adapted to arboreal locomotion. On each foot the five toes are grouped into two flattened sections, giving each foot an appearance like tongs. This provides maximum grip as the lizard slowly advances down a branch. Chameleons range in size from a fingernail to the Parson’s chameleon (27 inches long). 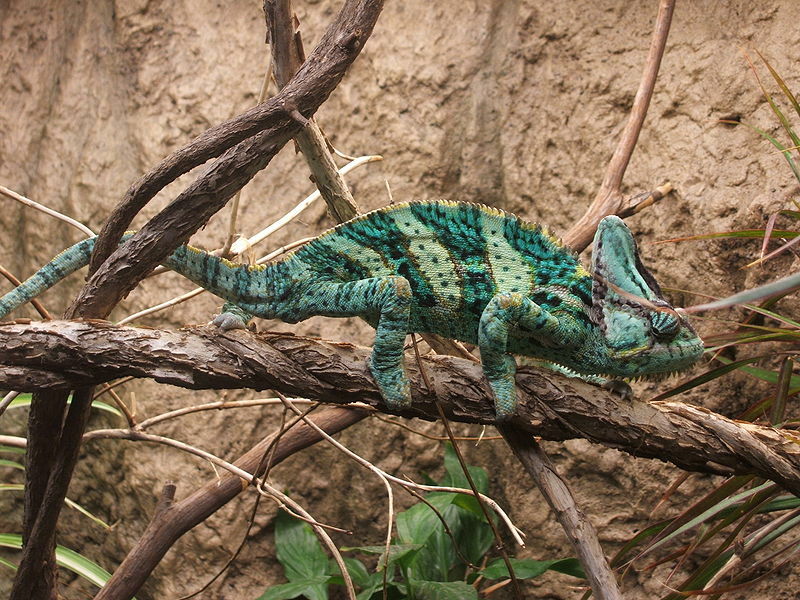 Perhaps the most striking characteristic of chameleons is their ability to change color. Typically they change colors between brown and green, but some can turn almost any color. This change can occur in as little as 20 seconds. Chameleons have specialized cells that lie in layers under the lizard’s outer skin. These chromatophores have red, yellow, blue or white pigment. When these pigment cells change, the chameleon’s skin color changes. While the changes might help the lizard blend into the surroundings; light, temperature, and mood also are factors. 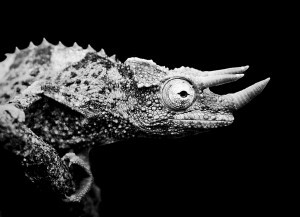 Although only superficially similar, the heads of the chameleons have been compared to the horned dinosaurs. 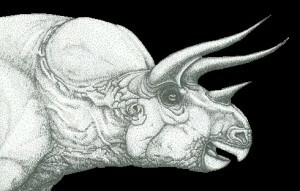 The Veiled Chameleon’s large frill is reminiscent of a Protoceratops (see above). The Jackson’s Chameleon sports three horns like the famous dinosaur Triceratops (see to the right). Perhaps these two very different horned reptiles employed their horns for similar purposes–for both display and jousting.